Double for Sweden: Tove Alexandersson (SWE) won the women’s class 3:29 ahead of Kamilla Olaussen (NOR) with Karolin Ohlsson (SWE) in 3rd at 4:41. Gustav Bergman (SWE) won the men’s class 35 seconds ahead of Olav Lundanes (NOR) with Matthias Kyburz (SUI) in 3rd at 3:34. The World Cup races in Norway this autumn are Pre-WOC for WOC 2019 which is organized in the same area. Olav Lundanes took the lead from the start, but from control 4 the Norwegian World Champion over the Long distance from Latvia a few weeks ago started to do some small mistakes while Gustav Bergman run with incredible speed, and Gustav Bergman could build up a 2 minute lead ahead of the long routechoice leg to control 10. Bergman loses more than a minute on this leg, but it was not enough for Lundanes to catch him up. The rest of the field 4 minutes or more in the first part of the course, and could never come up to Bergman. Here you can see how Bergman (blue color) took the wrong route at the long leg by running straight. The fastest route here is clearly to run left, using the road. Kuburz runs this leg on 4:48 min/km while Bergman is up in 5:37 min/km, losing 1:23 to Kyburz and 1:17 to Lundanes. Tove Alexandersson was again in a separate class, being faster than the rest on many of the decisive legs. The race development was very similar to the men’s class in that Alexandersson gains time on every leg before the long leg (to control 6 in the women’s race), and loses more than a minute on the long leg. 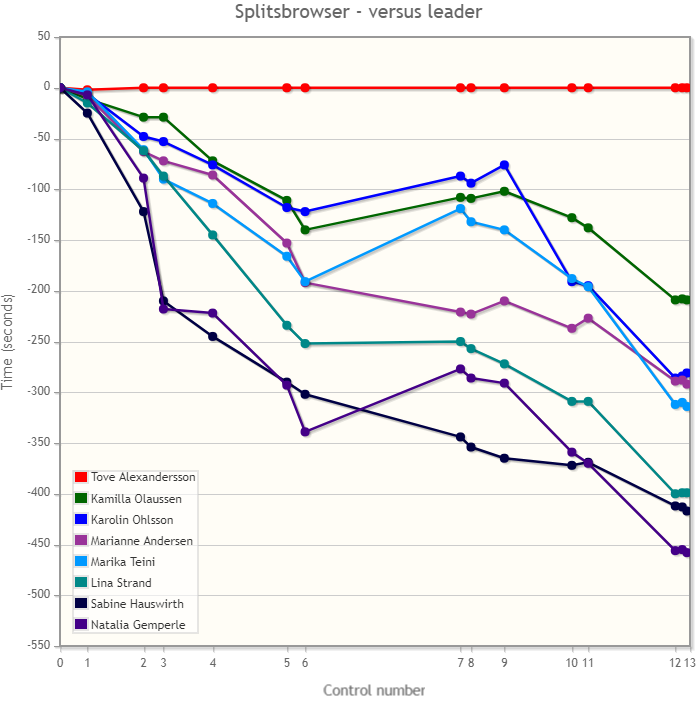 However, Alexandersson was also extremely strong in the end, increasing her lead. GPS-tracking from the race is available here. See maps below. Thanks. 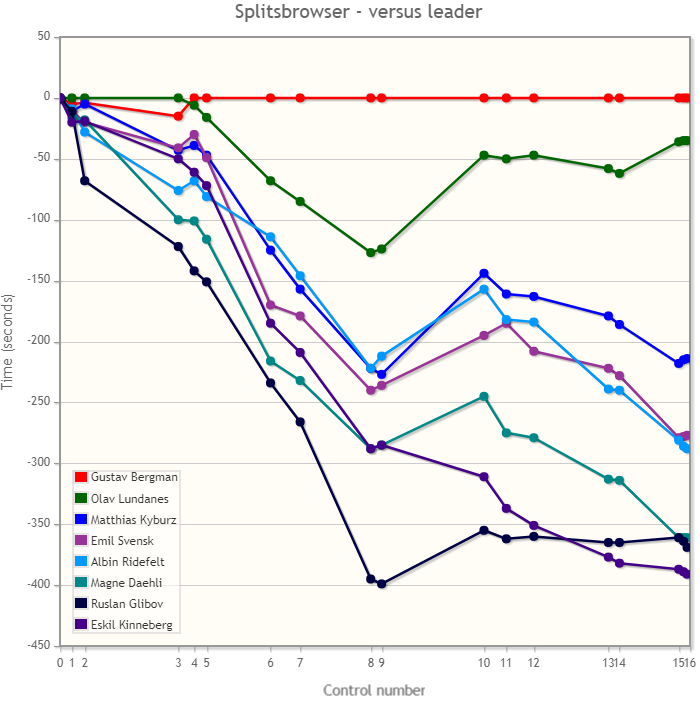 The 6 leg by the men has Bergman incredibly much faster than the others. Routechoice ?